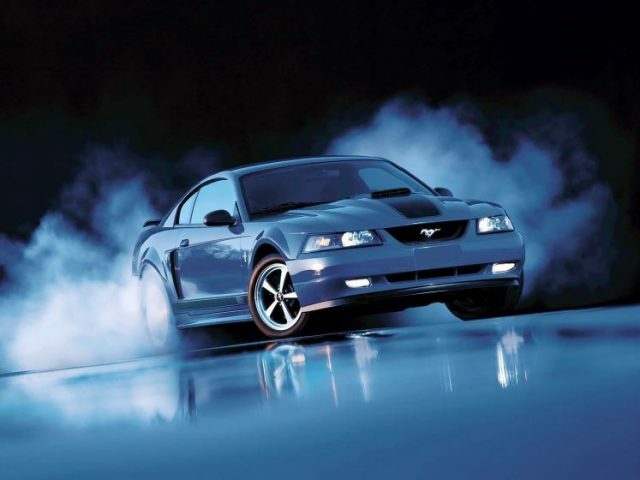 In this edition of Muscle Car Milestones, we’ll take a look back at the 2003-2004 Ford Mustang Mach 1. Ford dug deep into the Mustang’s past back in the early 2000s and recreated one of its legendary nameplates. The original Mach 1 was a fastback with attitude. One that many believed was one of the best Mustangs ever created. That’s a hard act to follow. The question now is, would the modern-day interpretation follow in its hoof prints? Let’s take a look and find out. Ford brought back the Mustang Mach 1 after a 25 year hiatus. This retro-inspired coupe featured styling cues from the original such as a black front air-dam extension, a black rear spoiler, and black striping on the hood and lower side panels and doors. It also included the original Mach 1’s signature shaker hood scoop finished in black. 17-inch Heritage wheels and body side scoops round out the package. 2004 models also included 40th Anniversary badging on the front fenders and rear deck. The interior is a bit of a throwback to the 1969 model. Climb inside and one of the first things you notice is the Mach 1’s exclusive “comfortweave” Midnight Black leather seats. They’re six-way power adjustable and feature four-way adjustable head restraints. And if you opted for the Interior Upgrade Package, you got aluminum-finish door lock posts, a gray metallic finish on the center panel and shifter bezel, and stainless steel pedals and footrest. The Mustang Mach 1 was a good alternative for those that didn’t want to pay the price of a Cobra but wanted more power than the GT. Under the hood lies an all-aluminum, 4.6-liter DOHC modular V8 creating 305 horsepower and 320 lb.-ft. of torque. This R-code engine also has specially calibrated camshafts, a ram-air system, a 10.1:1 compression ratio, and performance exhausts manifolds. A five-speed manual transmission was standard with the option of a four-speed 4R70W automatic with electronic overdrive. Out back, the Mach 1 utilizes a new rear axle with a high-torque differential and a 3.55:1 axle ratio. The suspension is also firmer for an improved ride and better handling. The Mach 1 also includes front and rear stabilizer bars, gas-pressurized Tokico struts, and 13-inch Brembo front rotors. The automotive press was more than happy to put the new Mach 1 to the test. Motor Trend scored a 0 to 60 time of 5.3 seconds and ran the quarter mile in 13.80 seconds at 102.5 mph. Car and Driver also put the Mach 1 through its paces and chalked up a 0 to 60 time of 5.2 seconds and sprinted the quarter mile in 14.0 seconds running 103 mph. Even by today’s standards, those times are still pretty quick. In comparison, the 1969 Mach 1 with the 428 Cobra Jet could go from 0 to 60 in 5.5 seconds and run the quarter in 13.90 seconds at 103.32 seconds. Just like the original, the 2003-2004 Mach 1 was a force to be reckoned with. It came out at a time when others had given up on the pony car. Its run may have been short but this iteration of the Mach 1 proved there was still life in the pony car segment. Fifteen years after its release, the 2003-2004 Mach 1 is still turning heads and commanding attention wherever it goes. Front: Independent, modified MacPherson strut with separate spring on lower arm and 26.5-mm stabilizer bar.